With the resignation of National Party MP Jonathan Coleman triggering a by-election in the electorate of Northcote, I thought it'd be an interesting exercise to delve into the numbers. The objective is to try and understand a bit more about how Northcote has voted since its creation in 1996, and see whether there is anything from its history that could help determine what might happen this time around. Northcote is generally considered to be one of New Zealand's three bellweather seat - the other two being Hamilton East and Hamilton West. 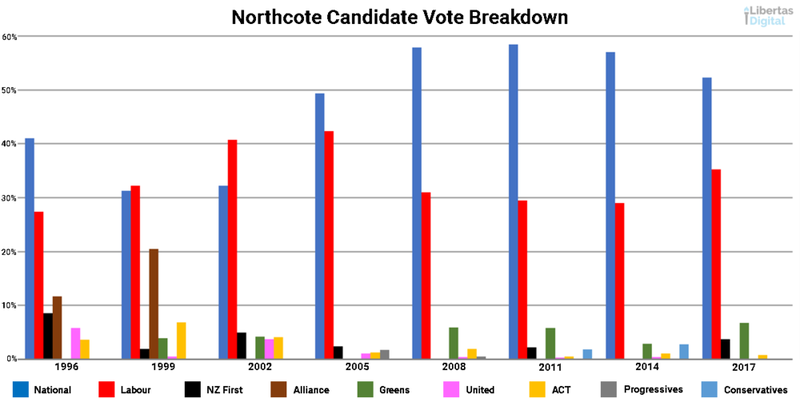 As you can see from the above chart, that's generally true for Northcote other than 2005, where it voted by 2 percentage points more for National than it did for Labour in its party votes. While National won Northcote on its creation in 1996, Labour took it in 1999 and held it in 2002. What was very interesting about 1999 was that the Alliance's Grant Gillon won 20.51% of the vote, and combined with votes for candidates from the other minor parties, had more votes than either National Ian Revell or Labour's Ann Hartley could manage. Since that high water mark in 1999 for the minor parties in Northcote, National and Labour have gobbled up the lion's share of the vote. National took the seat again under resigning MP Jonathan Coleman and turned it into a National stronghold by taking the seat with outright majorities since 2008. At the high point Coleman's lead over the Labour candidates was 29 percentage points in 2011, though in 2017 that had been reduced to 17 percentage points. Since 2005 on the party vote front, National has consistently over performed in Northcote relative to its performance across the rest of the country. 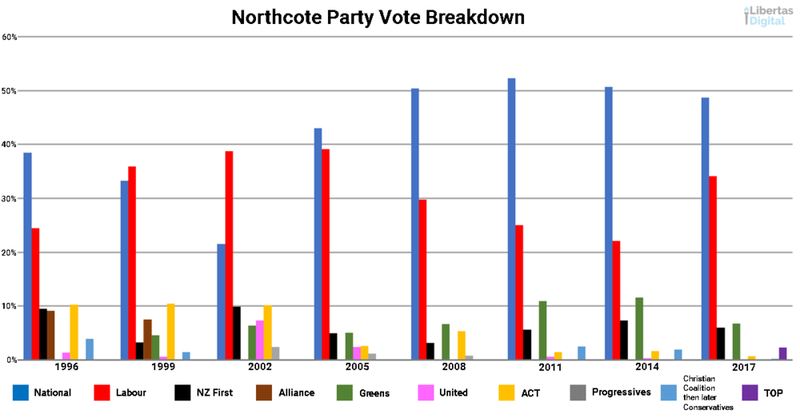 Across 2008-2014 Northcote delivered the majority of its party votes for National. Unlike the candidate vote, on the party vote front the high point for minor parties in Northcote, much as it was the for the country more broadly, the 2002 election. National's recovery in 2005 was the first major hit to minor parties in Northcote, followed by Labour's recovery in 2017. Interestingly, in Northcote in 2002 minor parties received a larger share of the party vote than either National (who hit their lowest ever result) or even Labour, a feat they repeated in 2014 at least in beating Labour. It's a powerful illustration of how when major parties fall on hard times their supporters flock to minor parties instead in the presumed hope that their particular interests will be better represented in opposition. When broken down by party over the period, it's interesting to see how National's success saw it cannibalise support for New Zealand First and ACT in Northcote, while Labour's fall from its 2005 high and subsequent rise in 2017 saw the Greens benefit, and to some extent NZ First recover, until 2017 hit them both. Taking a similar look at the candidate voting illustrates how much of a two horse race Northcote has been since 2002. Whatever Grant Gillon was doing in Northcote, he was doing it very well, because since then nobody has been able to crack double figures in challenging the National/Labour duopoly. This leaves us with the question - what does this all mean for the Northcote by-election? I think this means that Labour is right in the game and has every chance to win Northcote off National. When Labour is performing strongly in the party vote stakes they can, and they do win Northcote. How have I reached this conclusion? In Northcote National outperforms its New Zealand-wide party vote result by an average of 3.78 percentage points. On the flip side, Labour in Northcote underperforms by an average of -2.93 percentage points. Minor parties also underperform by an overage of 0.84 percentage points. With that in mind, and using the latest 1News Colmar Brunton poll from February 2018 as a starting point - with Labour on 48 per cent, National on 43 per cent, and minor parties netting the remaining 9 per cent across the country - I've calculated that things staying broadly true to their historical patterns, that would translate in Northcote to National getting 46.78 per cent, Labour 45.07%, and minor parties 8.15% of the party vote. That gives National a 4.58 percentage point advantage over Labour. If I use a slightly different measure - looking at the relative percentage difference rather than percentage points, it delivers a result still in favour of National, but with a 5.47 percentage point lead. With that predicted 4.58 - 5.47 percentage point lead in favour of National, it's worth considering a few other factors that will come into play. Labour has an immensely popular leader and Prime Minister in Jacinda Ardern. Where Labour seemed to perform strongly in the 2017 election was the youth age groups, those aged 18-34. Incidentally Northcote experienced a 1.29 percentage point increase in the turnout of those voters in 2017. In terms of usually resident population, Northcote has a median age of 35, that's versus a median age of voters in the 2017 election of 48. Northcote sits within the youngest third of general electorates, and is in company with some relatively strong Labour voting seats. Advantage Labour in terms of age demographics. Conversely, Northcote sits within the highest third of general electorates for median family income, and that places it in the company of some strongly voting National seats. So advantage National in that regard. In terms of ethnic breakdown Northcote has below below NZ rates of people identifying as Pākehā (European), Māori, and Pacific Islanders, but it does have more than double the New Zealand rate of people identifying as being from from Asian backgrounds. How this will play out is hard to predict. Under John Key and, to a lesser extent Bill English, National was fairly confident that that Asian-New Zealanders were generally strong National supporters. This was reinforced by Labour playing several xenophobic race cards over the past few years, including the "Chinese sounding surnames" debacle, Andrew Little's attack on Indian and Chinese chefs, and the moves to ban foreign buyers - a policy that's been seen as promoting anti-Chinese sentiment which inevitably impacts Chinese-Kiwis. National should still have an advantage in this regard, but it's notoriously difficult to quantify. Looking at religious affiliation (though admittedly this isn't a the strongest indicator of voting preferences in New Zealand largely due to Kiwis taking a relatively relaxed approach to religion, as is evidenced by having two openly non-religious Prime Ministers in recent memory, those being John Key and Helen Clark), Northcote has a slightly above average representation on non-religious people and slightly below average numbers of Christians vs New Zealand as a whole. I'll make the point again that this is a hard measure to use to predict voter patterns, especially as while National might generally be the party perceived as attracting Christian voters, Labour also has significant Christian support through its strong support in Pacific Island communities. This isn't so much of a factor in Northcote, but insofar that I'd argue that non-religious people are more likely to vote for Labour (even though I'm personally an exception to my own rule) I feel that potentially Labour might have a slight edge in this regard. While I've written about Ardern and how she turned out the youth vote for Labour - largely at the expense of the Green Party it seemed at the time - National has a different problem. Simon Bridges, while having been a relatively high profile minister and hence having more of a public profile than most new leaders might have, is still new to the role. He doesn't have the same name recognition that John Key or Bill English had, and as such can't be counted on to bring out voters like Ardern will for Labour. That's not a criticism of Bridges, rather it's the simple reality that he's new to the job of being leader and outside of a general election campaign it's generally hard to get cut-through with voters as an opposition leader. At the current stage of the electoral cycle, Labour does have an edge over National with regards to deploying their leader as a way to promote their candidate. I don't doubt that Simon Bridges will do as good of a job as any new leader for National could do, but it's important to acknowledge that he's also up against Jacinda Ardern who, along with being the Prime Minister, has already built a formidable media profile that's hard to match in such a short time. The other thing that should count in Labour's favour is that in a by-election minor parties typically either don't run candidates, or struggle to get any cut through. In Northcote's case, minor party candidates have particularly struggled since the highs of Grant Gillon. In 2008 and 2014 New Zealand First didn't run a candidate in Northcote at all, and neither did the Green Party in 2005. If I were Labour, I'd of already started negotiations with New Zealand First and the Green Party to not run candidates in the Northcote by-election, and I'd offer policy concessions in return. Bumping the Government's working majority up a vote would be worth it. If Labour were feeling especially devious, they could look at running one of their sitting List MPs in the seat, and pulling off the same trick that Winston Peters did to National in Northland in 2015, allowing Labour to bring in a replacement MP off the list if they won. That being said, I think Labour's best chance of winning would sit with picking someone who already has proven electoral experience in the area. 2014 Northcote candidate, and sitting Auckland Councillor Richard Hills springs to mind as perhaps Labour's best chance. Hills topped the Kaipātiki Local Board results in the 2016 election, but as he placed second to Chris Darby for the North Shore Ward, was elected as an Auckland Councillor instead. Funnily enough, old Grant Gillion of 1999 fame in Northcote missed out to Hills by 128 votes. Having already run in the seat in 2014, and subsequently becoming a Councillor for North Shore, I think places Hills in a strong position to help Labour take the seat from National. He also captures much of what the rejuvenated face of Labour looks like, and from what I can tell is a bloody hard working local councillor and all round nice guy. While some might criticise him if he stood for Northcote, having only become a councillor in late 2016, I'd argue that situations like this are just the nature of politics. It's probably a once in a lifetime chance to be able to represent your community at the national level, let alone potentially as a Government MP, and the subsequent by-election on North Shore is simply the cost of democracy, and it's a cost that I don't think anyone can reasonably object to paying. I don't think any reasonable person could criticise Hills for doing this. Which leaves us with National and who they might run. Newshub's Lloyd Burr has already cheekily suggested that Air New Zealand CEO Christopher Luxon wants to enter politics with the National Party. Luxon is based on the North Shore, though I don't know if he falls within Northcote's boundaries (not that this is necessarily a barrier for someone to become an MP). Luxon also has a significant amount of name recognition through his largely successful time at Air New Zealand. That alone could well be important in helping National fight off what should be a very strong challenge from Labour. National's other options include trying run their own List MP in the seat - with Paul Goldsmith and Melissa Lee being two possibilities if they relocated from their existing bases in Epsom and Mt Albert respectively - which would mean they could bring in another person off the List as well! Alternatively National might have a stellar local candidate in the wings who we haven't seen just yet. It's often said that by-elections are Christmas come early for beltway watchers, and the Northcote by-election is shaping up to be just that.